In general, proper chiropractic treatment of your body’s spine, involves very little risk and the rewards can be significant. Research has consistently shown that over 90 percent of the people that get treated by a chiropractor report significant improvement or resolution of their issue. Chiropractic or osteopathic manipulations can be especially helpful in relieving pain for disc and faced issues, osteoarthritis, and sacroiliac joint dysfunction, because such conditions respond well to mobilization. Moreover, scores of patients with chronic headaches, numbness in the arms and hands, leg pain, arthritis, and many other illnesses have reported significant relief from these conditions. 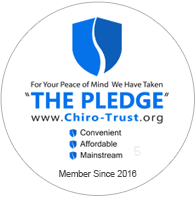 Increasingly, the medical community has come to accept and recognize chiropractic care as a valid form of treatment for a variety of neuro-musculoskeletal conditions. It is a conservative treatment option for patients with any physical ailment. Moreover, many medical doctors recognize a chiropractic diagnosis and accept it as the first line of treatment for functional disorders of the entire musculoskeletal system. If your condition doesn’t improve quickly or is outside the scope of chiropractic care; referrals are made promptly to the appropriate medical provider. 1.A 1993 report by the Ontario Ministry of Health concluded that chiropractic care was the most effective treatment for lower back pain. The agency also recommended that chiropractic care be fully integrated in the Canadian government’s health care system. 2.In 1994, the federal Agency for Health Care Policy and Research published its Clinical Practice Guidelines, which asserted that spinal manipulation was effective in reducing pain and speeding recovery among patients with acute low back symptoms without radiculopathy. 3.A 1996 New England Journal of Medicine study of outcomes and costs for acute low back pain found that patients treated by chiropractors were significantly more satisfied than those who saw primary care, orthopedic or managed care practitioners. 4.A 1996 study in the journal Spine echoed that study and found that patients who sought chiropractic care were more likely to feel that treatment was helpful, more likely to be satisfied with their care, and less likely to seek care from another provider for the same condition, compared to those who sought care from medical doctors.